AMC’s Halt and Catch Fire Season 2 review: How it pivoted to become a different, better show. In its second season, Halt and Catch Fire has swiveled to become a different, better show. 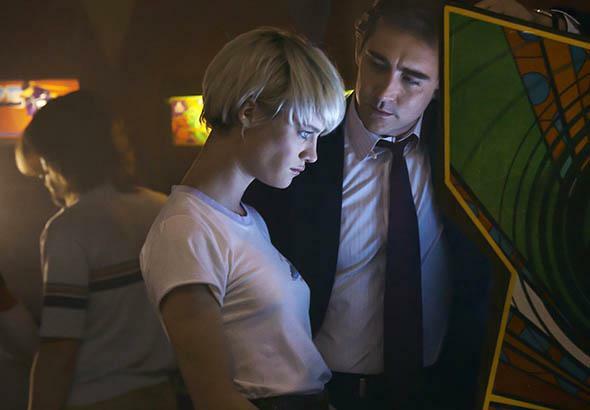 Mackenzie Davis and Lee Pace in Halt and Catch Fire. Until recently, pivot—an elegant little word centered around an evocative hinge of a V—called to mind necks, Ross Geller, and avoiding the double dribble. It has lately been drafted by Silicon Valley, where it has become a term of art to describe a tech company’s swiveling mission, often under duress. For example, before Instagram was Instagram it was Burbn, an overly complicated Foursquare-like check-in app whose customers were using it mainly to share photos—at which point it pivoted. AMC’s Halt and Catch Fire, a series about tech entrepreneurs, albeit ones in 1980s Dallas, begins its much-improved second season having undergone a pivot of its own. In its first season, Halt told the story of a quartet led by two men laboring to bring a new, better technology to consumers. In its second season, Halt tells the story of two women laboring to bring a new, better technology to consumers with an assist from a houseful of gamers. The adjustment may sound slight, but as successful pivoters—billionaires on paper, anyway—would surely be happy to explain, the right pivot can make all the difference. Last season, Joe MacMillan (Lee Pace), a charismatic manipulator, visionary, and emotional basket case, set out to build a revolutionary personal computer. Lacking any of the concrete skills to do so, he partnered with hardware expert and family man Gordon Clark (Scoot McNairy), who was fortuitously married to the equally skilled Donna (Kerry Bishé), and hired androgynous, punk programmer Cameron Howe (Mackenzie Davis). Together, the foursome created a cutting-edge computer that was still outmaneuvered by a lesser product right before it went to market. As the new season begins, Joe and Gordon are at loose ends, but Cameron and Donna are energized and focused, working long hours at the company Cameron created—Mutiny, a dial-up subscription service that creates and hosts video games online. Cameron—with her shock of short platinum hair, her indifference to hygiene and manners, her awkward interpersonal skills, her brilliance and total devotion to code—initially stood out for being an odd blend of the gorgeous love interest (she and Joe became romantically entangled nearly the moment they meet) and the ultimate proto-techie. Her vision and dedication mark her as the ancestor of the guys who, today, chug Soylent because frozen burritos both take too long to make and are nutritionally inefficient anyway. (In a recent profile in the New Yorker, venture capitalist Marc Andreessen identified her as “the future.”) Meanwhile Donna, who was introduced as yet another wife using responsibility as a cudgel to keep her husband from his dreams, has blossomed into a character with ambitions all her own. The show gave audiences the same first impression of Donna—square, ignorable, domestic—that Donna has to counter in her own life. Halt and Catch Fire may be set in the ’80s, but it is very much in conversation with the current moment, when tech companies, their CEOs, their valuations, and their hubristic utopianism are both idolized and pilloried, a constant source of fascination. (Versions of Joe, a true believer with the manner of a snake-oil salesman, are regularly satirized on HBO’s Silicon Valley.) Much of the pleasure of the first season came from knowing, as a member of the audience, just how prescient the protagonists were even as their contemporaries did not. Joe, proselytizing about creating computers that people could love, only sounded cuckoo to colleagues who had never seen the lines for a new iPhone. Cameron’s desire to make a computer that could communicate only seems ridiculous to someone who has never asked Siri a question. The new season is even more attuned to the present. Cameron and Donna are two women starting a tech business in 1980s Dallas. Lean In, Gamergate, and the ongoing under-representation of women in tech hang heavy over the episodes. (AMC’s publicists are certainly aware of this: “As you know,” one wrote in an email to me about the new season, scare quotes included, “ ‘Women in Tech’ has become a hot-button topic.”) In the first four episodes, Cameron and Donna are run through the stations of the Lean In cross: They have to deal with a physically intimidating male associate, an insecure husband, and a potential investor who doesn’t believe mothers can work hard enough, among other textbook indignities. Halt and Catch Fire’s conversation with now can get hokey. When Cameron dreams up a first-person shooter game and Donna becomes fascinated by chat rooms, the show begins to feel downright Forrest Gump­-ian: Its characters have a role in every breakthrough. But what is so satisfying about its treatment of sexism, beyond the simple fact of representation—it is a series about technology that is also fundamentally a series about women, and no one had to tweet irately to make it so—is not the extent to which the sexism conforms to our expectations, but that the women involved do not. Neither Cameron nor Donna, for example, wants to be the boss of Mutiny. Whereas now that might kick off a shame spiral about ceding authority and control to a no-more-qualified man—does Cameron have imposter syndrome?— both Cameron and Donna would rather do what they love, and that’s not overseeing the day-to-day work habits of dozens of stinky coders. When leaning in hasn’t yet been codified, you can swing in any old direction without smacking into a rule. Donna and Cameron react to their circumstance without a manual. Sometimes that means they go all geek Thelma-and-Louise on a creep. Sometimes that means they cut each other down. Sometimes that means Donna sits in the bathtub, avoiding her children, probably wishing a book like Lean In, and the community of working women it presumes, existed. Whatever they do, they are unburdened by the knowledge that three decades later the phrase “women in tech” will refer to an ongoing problem and not a series of accomplishments. From the past, our present still looks bright.